How To Clean Stainless Steel! 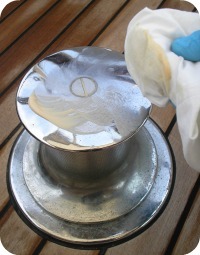 In this How to Clean Stainless Steel - guide, I will show you to get your boat look at it's best. 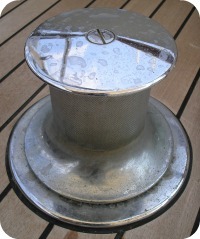 On our sailing and motor boats we have many stainless steel boat fittings. 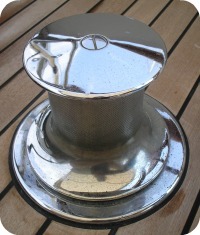 Polishing your stainless steel is not hard. It's a maintenance job you have to do from time to time, but boy... it makes your boat shine like a thousand stars! 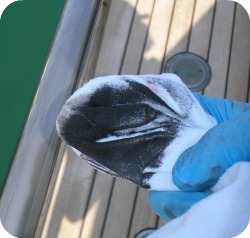 First of all you have to wash down your sailing or motor yacht with fresh water, to get all the salt and dirt off. Once everything is dry, you get the polishing goodies out. Very simple, you need a good quality polishing product and some clean rags. Because of the chemical substances, I always wear latex or nitrile gloves. 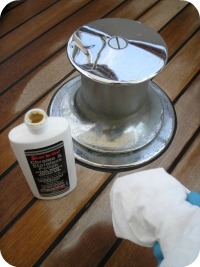 You'll find a lot of polishing products in the shipchandler. 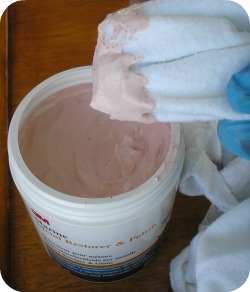 I always use pastes, although you can find liquids too. You have to try a few and then you choose your favourite. 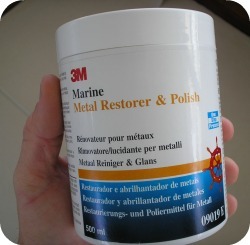 The polishing product from 3M is also good to polish brass, bronze, copper, chrome, aluminium and other marine metals. So, it's very versatile! 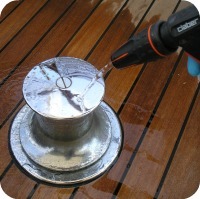 Polishing your marine stainless removes the surface rust, corrosion, oxidation and tarnish. It makes your boat fitting bright and shiny! Another good thing to know is, that if you leave your stainless steel fittings too long without their regular polishing treatment, you might find your boat fitting pitted... this is not good. So, whenever you see that the corrosion is coming back, get yourself ready for some polishing! Now, you take a bit of polishing paste on your clean piece of cloth and you start rubbing it in. I move in circles and if that's not possible, like on your stainless boat railing, I slide with the cloth from one side to the other. You'll see that the cloth turns black. This means you're winning from the dirt! When you see that the boat fitting looks clean and all the rusty spots are gone, you take another clean cloth and you go over the cleaned part again. This removes the paste residue and now you should see yourself perfectly in the stainless!